Fall is just around the corner and a lot of are getting things ready to welcome the season. I love the fall time. The days start to get a little more crisp. Today in this post I will be showing you how to make your own faux flower arrangement so you don't have to buy fresh flowers every week. It's a great way to save! First you will begin by cutting all the flowers in sections. Take off all the leaves because those make the faux flowers definitely look fake and not to mention cheap. When you have all your flowers stripped, put them aside. Here's some pictures of the flowers I purchased so you can give yourself an idea since I don't know the name of each flower. Right now you can find them at Jo-Anne's on discount! 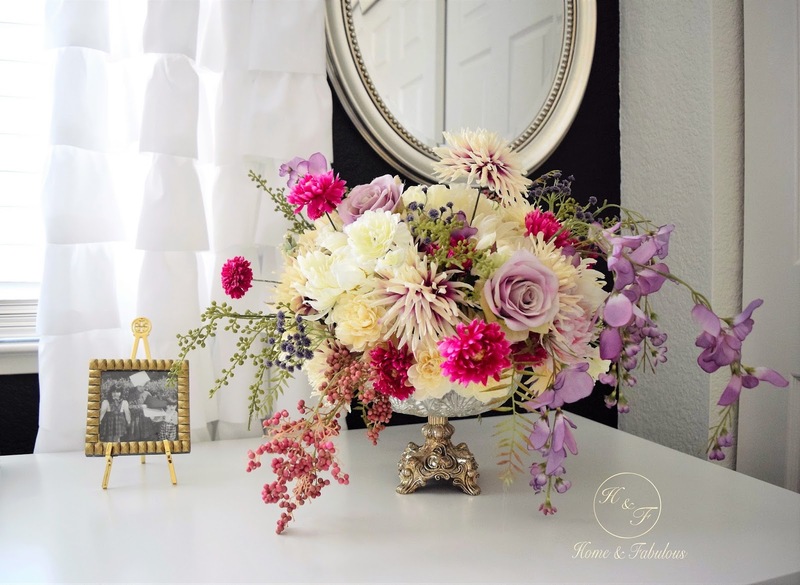 Try to look for the ones that look more realistic to give your arrangement a better look. Grab your vase and foam and measure out the size of foam you need for your vase. In my case, the foam I bought was the perfect size for the vase I used. It doesn't reach the bottom of the vase which is what I wanted. Since my vase is transparent, I don't want the foam to show on the bottom. Now that you've cut your foam and glued it to the vase, cut a couple pieces of tape and put them around the vase so it doesn't move and come out the minute you start putting your flowers in. Now it's time to put the flowers. Start by putting flowers around the vase so it starts looks full. Now that you've done that, keep adding flowers but this time don't stick them all the way down. Leave them a little out as if to be floating in the air. Not pushing them all the way down will make them look more natural. Keep adding flowers until you don't see any foam in your vase. Start adding greenery making sure you cut long pieces so they drape down your arrangement. This ensures your arrangement looks realistic. I tried to make the color purple stand out from all the flowers I purchased since that's the color I'm using for this fall. You choose your color and you'll see how easy it is to make your own arrangement! You'll have flowers to last you. These purple hanging flowers look so beautiful and real. Try to only hang them on one side. Don't put them all around the arrangement. Voila!! Here's the final result. Came out great didn't it? I love how it looks in my house! Like I said before, this arrangement will last me a long time and I don't have to worry about buying flowers. Leave me your comments below and let me know if you liked this and want to see more DIY. Until next time! Wonderful post! I can't wait to try this! I actually thought it was a live arrangement before I started reading your blog! Your house is amazing too! I also love the little "I love you" hand sign sculpture. Where did you find that? Thanks! Thank you for stopping by my blog and your comment! Send me a picture once you’ve finished I would love to see it J The I love you hand sign is from Home Goods. Curious as to why you didn't cut the floral foam at an angle to fit the vase better by wedging it in ? I love the coffee table. Is there a drawer on the end ? Can you show it again in more detail ? I left it that way because it was the perfect size for my vase and I didn’t want it to show towards the bottom so it would look more natural. I’m a first timer at this so there’s still a lot to learn but thank you for your assurance! The table does have a drawer. I’ll post more pictures up soon and thank you for stopping by the blog and your comments as well. I love the way you put your arrangement together. I can't wait to try doing this for my living room. I get very little natural light there so I can never have real flowers on my coffee table. I’m so happy you like the arrangement. I’m also happy to hear you want to make your own! Send me a picture via email or Instagram so I can see the finished result. Thank you for stopping by my blog as well! I cannot rave enough about these guys. I found the Flower Delivery Los Angeles online and ordered beautiful floral arrangements for an engagement party. They were lush, artful and beautiful- not a typical florist. I will absolutely be returning; they did an amazing job. These are so very beautiful, actually looks real!! I sure wish I could get the names of the flowers as I am completely lost when buying faux. Thanks for sharing = ).